Archbishop Krebs reads the Decree of the Holy Father at approximately 12:00 minutes. Archbishop Hon speaks to the faithful at the 21:00 minute mark. Archbishop Martin Krebs and Archbishop Savio Tai Fai Hon address Guam's faithful from Undercover Neo on Vimeo. why was this not held at Agana, and were there NEO priest present? Msgr. David C. Quitugua, the new Cathedral-Basilica Rector, has taken our Mother Church into disrepair. Whereas, Msgr. James L.G. Benavente has greatly improved the St. Anthony Church facility and it is now the best church to accommodate our new Apostolic Administrator. The NEO priests were present but were not enthusiastic. I'd hate to second guess any intentions, but it seems quite the statement that this was held in Tamuning and not Agana, doesn't it? - Gerald Taitano - I have not seen the inside of the St. Anthony Church in many many years since I have been gone from the Island and I am really in Awe with how Beautiful it truly is! It totally over-shadows the Agana Cathedral which used to be the "Center Piece of Catholic Churches on Guam"! Congratulations to the Parish of Tamuning! Tim, will you be able to provide a transcript? Good question, JD, why wasn't the mass held at the Cathedral? I drove by the Cathedral last night, and in the still of the night, I was overwhelmed with anger when I saw the NCW's 4'x8' sign inviting people to their meeting! They need to stay out of any of our archdiocese's property!! What arrogance! Archbishop Hon has his work cut out! 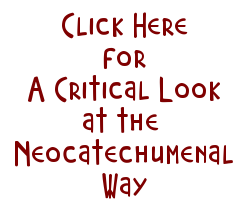 I sincerely hope and pray that he will come to his senses that the neo hierarchy are self-serving; that they are NOT Catholic; and hope that he reports to the Pope how cult-like the NEOS are, so that SOON they will get their walking papers out of Guam and out of the Catholic Church world-wide PERIOD! Let us keep ArchBishop Hon in our prayers. Yes, Tim, if possible would you please provide a transcript? I am off-island and as I was watching/listening to Archbishop Hon's speaking I could not make out much of what he said. Unfortunately, I only heard what you did. I'll see what I can find. I hope Archbishop Hon forces all the NCWs to obey all their Vatican-approved statutes. Some may be so displeased that they will move elsewhere. 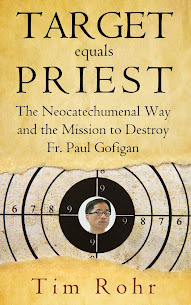 Will Pius and cohorts piss on the Apostolic Administrator's mission to clean house? It seems like a natural result from all that KAKA consumed. Let it not be lost on anybody. The gathering of the faithful yesterday at St. Anthony just proves that nobody is out to destroy the Catholic Church in Guam. I hope those who keep saying that the attacks on them is an attack on the Church will stop doing so. We are not attacking the Catholic Church.